The German Shorthaired Pointer was developed in Germany during the 1800’s, it was first registered in German Kennel Club Stud Books in 1872. 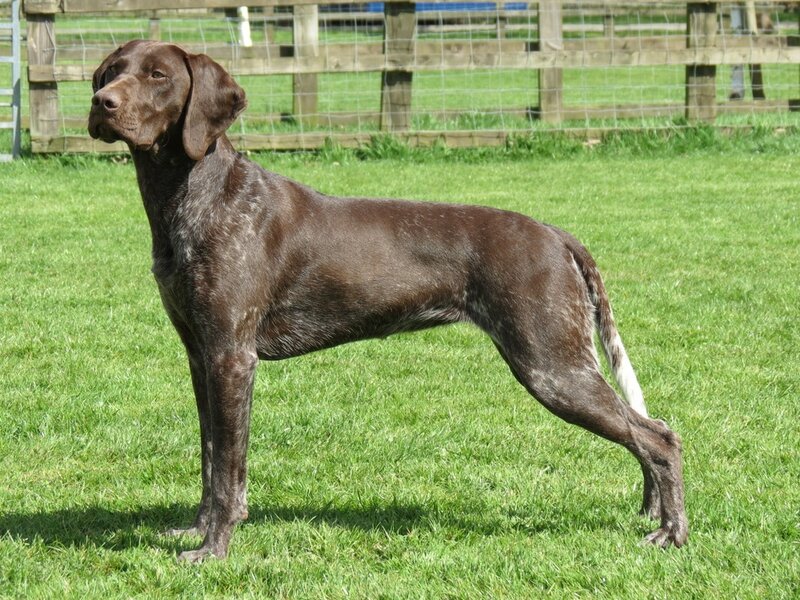 The German Shorthaired Pointer was created by crossing old Spanish Pointers with numerous other breeds including, Foxhounds, German Bloodhounds, English and Black Pointers. The combination created a responsive, dual-purpose gundog with great versatility, being able to retrieve both fur and feather on land and water. 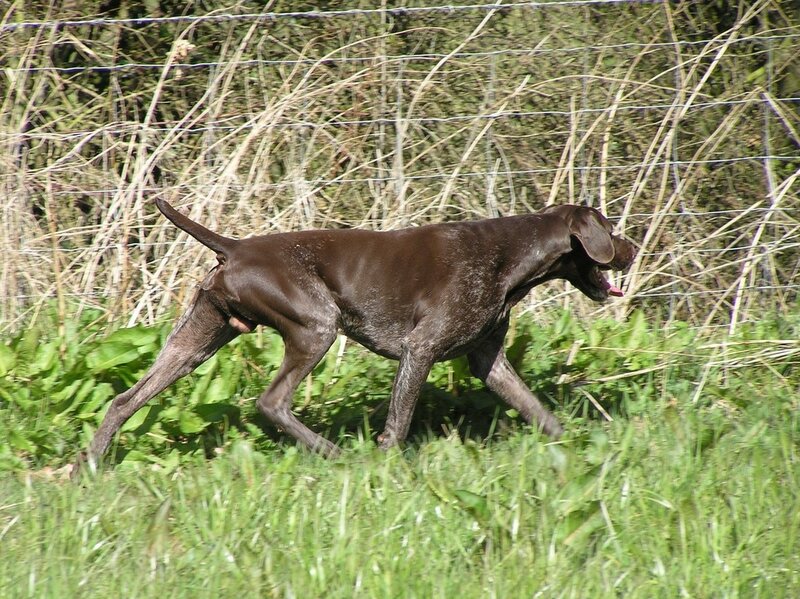 The pointing and scenting abilities of the GSP are highly prized; the short course coat and well muscled body further enhance its value as a gundog. The efforts of nineteenth century German breeders have created a dog today that is one of the most versatile of all gundogs. Noble, steady dog showing power, endurance and speed, giving the immediate impression of an alert and energetic dog whose movements are well co-ordinated. Of medium size, with a short back standing over plenty of ground. Grace of outline, clean-cut head, long sloping shoulders, deep chest, short back, powerful hindquarters, good bone composition, adequate muscle, well carried tail and taut coat. Teeth sound and strong. Jaws strong, with a perfect, regular and complete scissor bite, i.e. upper teeth closely overlapping lower teeth and set square to the jaws. ForequartersShoulders sloping and very muscular, top of shoulder blades close; upper arm bones, between shoulder and elbow, long. Elbows well laid back, neither pointing outwards nor inwards. Forelegs straight and lean, sufficiently muscular and strong, but not coarse-boned. Pasterns slightly sloping. FeetCompact, close-knit, round to spoon-shaped, well padded, turning neither in nor out. Toes well arched with strong nails. Docked: Starts high and thick growing gradually thinner, customarily docked to medium length by two fifths to half its length. When quiet, tail carried down; when moving, horizontally. Never held high over back or bent. Undocked: Moderately long, not reaching below hocks. Strong at root, becoming gradually thinner. Carried horizontally or just below line of back. Smooth, lithe gait essential. As gait increases from walk to a faster speed, legs converge beneath body (single tracking). Forelegs reach well ahead, effortlessly covering plenty of ground with each stride and followed by hindlegs, which give forceful propulsion.